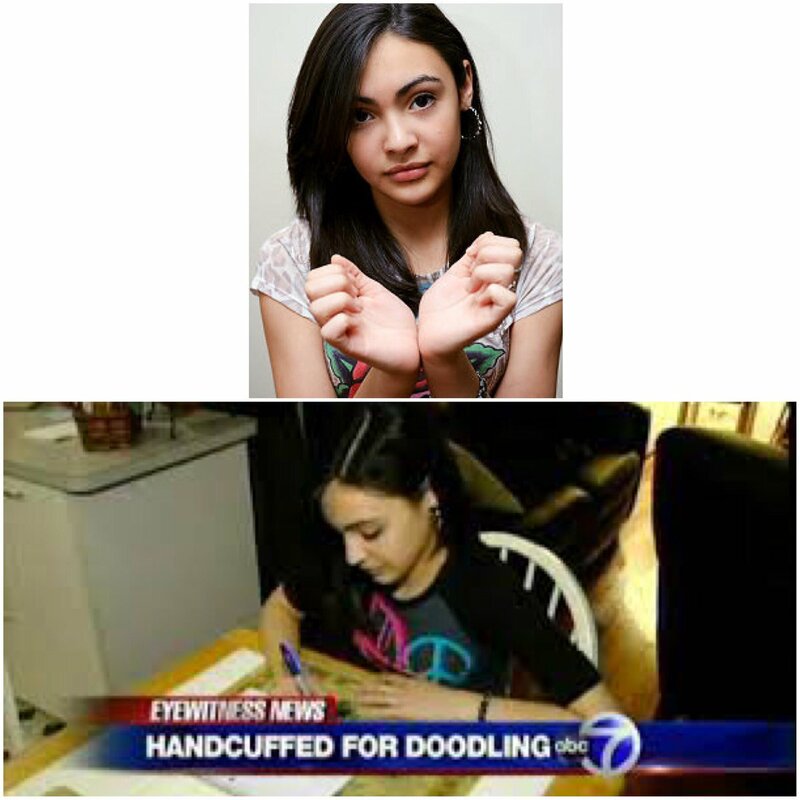 Unlabelled A 12-year-old girl was arrested, handcuffed, and detained at a police precinct for several hours for doodling on her desk in class. A 12-year-old girl was arrested, handcuffed, and detained at a police precinct for several hours for doodling on her desk in class. A 12-year-old Queens girl was hauled out of school in handcuffs for an artless offense - doodling her name on her desk in erasable marker, the Daily News has learned. "I love my friends Abby and Faith," the girl wrote, adding the phrases "Lex was here. 2/1/10" and a smiley face. "I started crying, like, a lot," said Alexa. "I made two little doodles. ... It could be easily erased. To put handcuffs on me is unnecessary." Alexa, who had a stellar attendance record, hasn't been back to school since, adding, "I just thought I'd get a detention. I thought maybe I would have to clean [the desk]." "She's been throwing up," said her mom, Moraima Camacho, 49, an accountant, who lives with her daughter in Kew Gardens. "The whole situation has been a nightmare." City officials acknowledged Alexa's arrest was a mistake. "We're looking at the facts," said City Education Department spokesman David Cantor. "Based on what we've seen so far, this shouldn't have happened." "Even when we're asked to make an arrest, common sense should prevail, and discretion used in deciding whether an arrest or handcuffs are really necessary," said police spokesman Paul Browne. Alexa is the latest in a string of city students who have been cuffed for minor infractions. In 2007, 13-year-old Chelsea Fraser was placed under arrest for writing "okay" on her desk at Intermediate School 201. And in 2008, 5-year-old Dennis Rivera was cuffed and sent to a psych ward after throwing a fit in his kindergarten. A class action lawsuit was filed by the New York Civil Liberties Union last month against the city for using "excessive force" in middle school and high schools. A 12-year-old sixth-grader, identified in the lawsuit as M.M., was arrested in March 2009 for doodling on her desk at the Hunts Point School. Alexa is still suspended from her school, her mother said. She and her mom went to family court on Tuesday, where Alexa was assigned eight hours of community service, a book report and an essay on what she learned from the experience. "I definitely learned not to ever draw on a desk," said Alexa. "They told me with a pencil this could still happen."